Originally designed in 1998, this real estate marketing office was adapted and remodeled multiple times to correspond to marketing plans and strategies for various luxury properties over 12 years. The materials and detailing required a high level of finesse. The tone needed to be professional but also intimate and residential in feel. The core palette of materials also needed to be easily transformed to suit the image of multiple real estate properties. This adaptation, transformed from the original incarnation, merged the classic detailing of warm wood paneling with new, cooler colors, brighter graphics and solid but more contemporary furnishings. Interior drapery adds a residential feeling and softens acoustics. 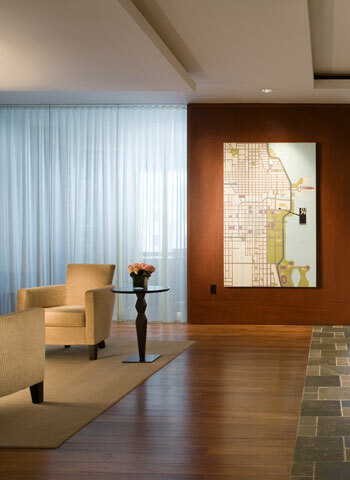 Warm lighting pools create intimate lounge areas and meeting rooms. 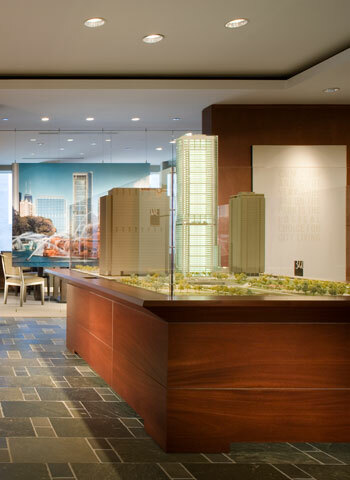 Marketing models and graphics are given center stage so that strong visual cues for the project are presented dramatically as visitors approach the glass entrance to the sales office. Real Estate Sales Center was designed by Patrick McGuire for Related Midwest.